Introducing a perfect idea for this fall: Make-Ahead Pumpkin Donuts! Indeed. We can mix up the pumpkin donuts, roll out the dough, cut the shapes, then freeze the uncooked dough on parchment paper or silicone mat-lined cookie sheets. We transfer the frozen dough into freezer bags, then any time we want fresh donuts (and when would we not want fresh donuts? ), we can grab some out of the freezer and fry them up fresh to eat while sipping a cup of coffee, tea, or hot chocolate. 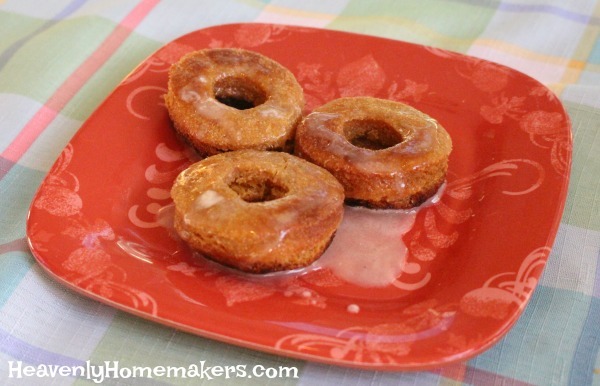 Can you think of a better breakfast treat to enjoy this fall than fresh homemade Pumpkin Donuts? The best part is that the mixing, rolling, cutting, and clean up will have already been taken care of! Well, clearly the best part is eating the fresh donuts. But eating the fresh donuts without looking at a messy kitchen that you’ll have to clean up afterward? Fabulous. Stir together whole wheat flour, baking powder, sea salt, ground cinnamon, nutmeg, and sucanat. Add melted butter, eggs, vanilla, buttermilk, and pumpkin puree – mixing until all ingredients are well combined. Roll dough on a well-floured surface. Cut out donuts and donut holes (makes about 30 of each). Lay the cut outs on a parchment-paper lined cookie sheet and freeze for at least 2 hours. Transfer prepared donuts to a freezer bag to store in the freezer until ready for use. To Cook: Set donuts out of the freezer at room temperature for about 15 minutes before frying. 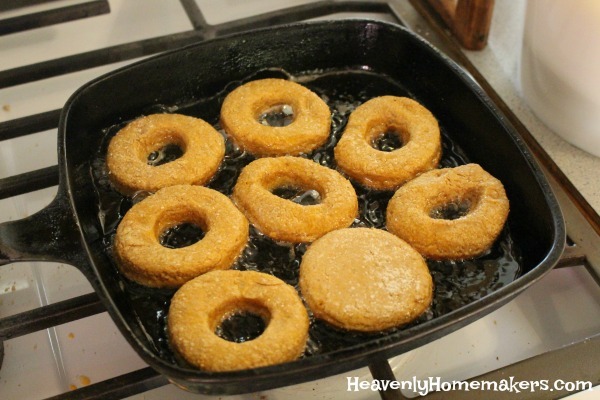 Fry dough in hot oil for about 3 minutes or until donuts are golden brown. Whisk glaze ingredients together and drizzle over warm donuts before serving. Concerned about the fact that these treats are fried? Don’t be! Coconut and Palm Oils can withstand high temperatures without becoming harmful to us. So instead of fearing the fry, we can actually enjoy the healthy fat we’re getting while enjoying these donuts. But of course, let us not ever eat more donuts than veggies, yada, yada. You know the drill. WAIT. There are veggies in these donuts (thank you, pumpkin, for being there for us when we need you). So I guess we can enjoy these to our heart’s delight, all while enjoying the fact that you can make them ahead and freeze them for ease in the kitchen. This is what I call one happy fall recipe! Laura, these look amazing! I will try them this week for sure. New braces and hurting teeth on one of my kids will make this soft breakfast a REAL TREAT! Thanks to you, I bought a NutriMill a couple of years ago and have been grinding my own flour to make bread, quick breads, homemade waffles, etc. Question: I thought for baked goods, you typically use soft white wheat? yet this recipe calls for hard white….can one be substituted for the other? What are the differences between hard white and soft white? Thank you for your terrific recipes (and atta-boy reminders for good fats). Oops! Either one works for this recipe so I edited to share that! Oh my! Another awesome looking recipe that I have to try ASAP! Thank you! I was right – these donuts were a hit! I dipped some of them in the glaze & some in powdered sugar. My family thanks you! 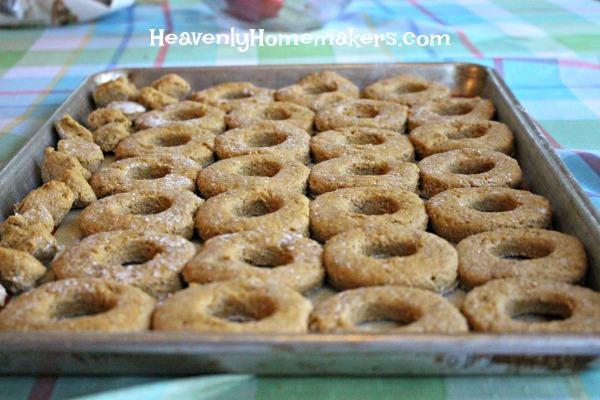 These pumpkin doughnuts are my kids favorite, and a much requested item all year around, and especially on birthdays. Now, I’m scared (j/k, yay!). We will be eating these so much more now. They are so good! And we just use powdered sugar as a topping for one less step. Laura, does Grapeseed oil work as a high heat oil too? I just mixed up this recipe… is the dough supposed to be sticky or more like a kneaded bread dough? More like kneaded bread dough so it will roll out easily without sticking to the counter. If it’s too sticky, just add flour until the dough is right!